Should You Wash Cushion Covers? 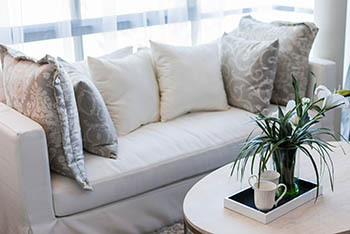 | Crystal Clear Enterprise, Inc.
It’s a very easy thing to do… you notice your sofa cushions are a little dingy, which is perfectly normal with kids, pets and normal usage. So you decide to do-it-yourself and wash the cushion covers. They come out looking nice. But you also notice a little problem. The colors aren’t as bright as they used to be, and it takes a lot of effort to get the covers back over the foam cushions themselves. In fact, for one cushion, you can’t even get it zipped up all the way. The reason is that cushion covers are not designed to be washed like normal laundry. “But it has zippers!” you exclaim. That’s for the convenience of the furniture manufacturing company or the upholsterer. 1. When you wash the cushion covers, there is some danger in fabric shrinkage and dye loss. If this happens, not much you can do to fix it.